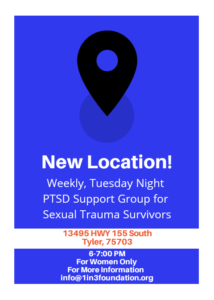 The women’s only PTSD Support Group for Sexual Trauma Survivors will led by Brenda McBride, LCSW and Licensed Brain Gym Instructor. Sessions include Cognitive Behavioral techniques, Eye Movement Desensitization and Reprocessing (EMDR®) calming strategies, Brain Gym®, Tension and Trauma Reducing Exercises (TRE®), Trust Based Relational Intervention (TBRI®) and other evidenced-based interventions. It is the intention of the 1 in 3 Foundation to provide funding for new programs and activities for women survivors of childhood sexual abuse or sexual assault not in existence or not formally established in Smith County, Texas.